The Starlost - DVD Review - Classic Sci-Fi From 1973! - Are You Screening? The Starlost is a rare gem of classic television, and you’ve got to love the people who are releasing incredible stuff like this. 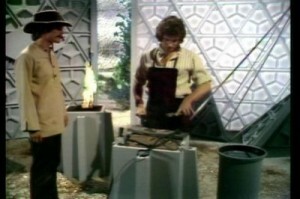 Coming to you straight from the special effects powerhouse that is mid-budget, 1973 Canadian television, The Starlost is a 16-episode adventure in space which simply cannot be compared to anything before or since. 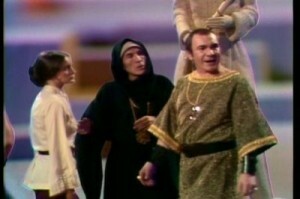 The show takes place on The Ark, an enormous spaceship launched just prior to Earth’s impending, and unexplained, doom, in order to seek out a new home planet. By fantastic plot contrivance, the humans on board have been sectioned off into domes, which are roughly fifty square miles worth of land, and kept apart from those in the numerous other domes. What contact the domes were meant to have with each other, and those running things is unclear. Our story begins with Devon, Rachel, and Garth, occupants of one of said domes, stumbling onto a way out of their dome. Their particular section of reality has developed into something like Little House on the Prarie, but with the occasional future-tech thrown in. When they make it out of their dome, they discover the truth about The Ark. First, that they are on a spaceship, and all that goes along with that. More importantly, that The Ark is on a collision course with a star, and they’re all going to die. It turns out that some accident killed the entire crew over 500 years ago, and The Ark has been drifiting ever since. Apart from the wide open possibilities available as our three heroes stumble around the enormous Ark looking for a way to save it, the series has a lot going for it. Wonderful guest appearances abound, including John Colicos, who would go on to portray Baltar in Battlestar Galatica five years later. From the other direction, Walter Koenig, a few years after Star Trek‘s Chekov, is in two episodes. It was also created by Harlan Ellison, and had Ben Bova attached as a consultant. Now, a couple of the episodes do drift over into the criminally stupid, and the special effects are absolutely laughable, but the show has a real spark of imagination to it. Where sci-fi today is often all about looking at the wonderful advances in effects, a show like this had to work at making something worth watching with very little. All that said, I have to admit that I’m inclined to agree with whatever reaction you may have to the show, positive or negative. I mean, it is stupid. It’s also sort of genius in its own way. It’s probably the best corny fun ever filmed, if you can go into it the right way, and it may give you something to think about as well. It is unfortunately priced away from the experimental viewing, and aimed more at those who might already be fans. Such is sometimes the way of things when you’re really unlikely to make anything up in volume. It’s worth a look though, however you manage it. Witness the awesomeness that is the show’s opening!